With many of us running multiple e-mail and social networking accounts – as well as the bread and butter address book – keeping track of it all can often leave our heads spinning in confusion. 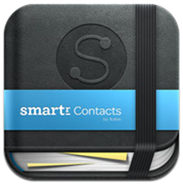 Smartr Contacts, an app developed by Xobni specifically for iPhone users, aims to keep every person you communicate within one, easily navigated archive. Like most apps nowadays, it does the work you cannot be bothered to do – trawling through the likes of Facebook, LinkedIn and Twitter, automatically adding a customizable profile for those you’ve spoken to in the past. Obviously, you wouldn’t necessarily want or need every single person you’ve connected with in the last several years, thus Smartr has a handy ‘hide’ feature allowing you to remove them from your list without hassle. Indeed, if you frequently correspond with companies regarding warranty or complaints, for example, you’ll undoubtedly discover many irrelevant e-mail accounts you’ve accumulated, most of which you’ll likely want to sweep out of sight. 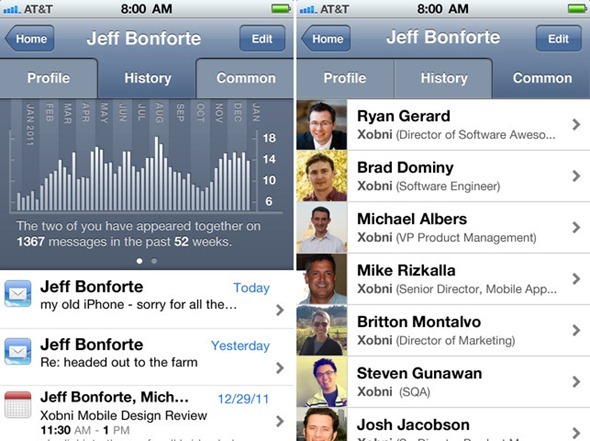 You’ll surely be surprised (as I was) to see just how many contacts end up on the list. Having merely added a Twitter account and an e-mail address, there were over 2000 sourced in total – way too many for me to even begin tidying up with uniform formatting and pretty little profile pictures. Nevertheless, it’s great if you urgently need to get into contact with somebody you’ve spoken to in the past. 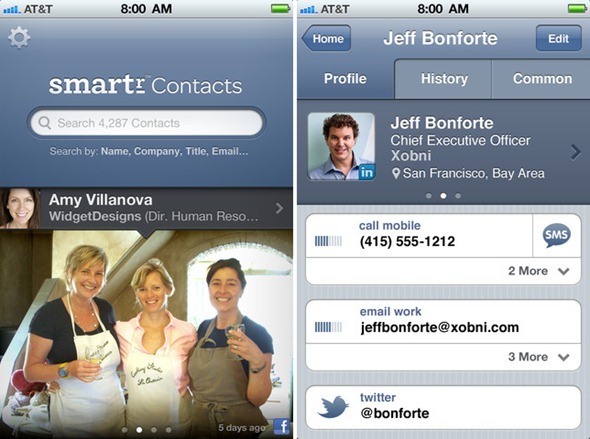 All you need to do is open the app, search for the name, and the contact details will be ready and waiting. It’s free, which is a rarity in an era where many useless apps are simply put out there for minimum price to generate some easy revenue. It’s advertised as iPhone-only, but works on the iPod touch as well as the iPad – although you’ll either need to squint, persevere with the pixelated visuals in x2 mode, or download RetinaPad from the BigBoss repository – that is, of course, if you’re jailbroken. Download it, give it a whirl, and let us know what you think of it via the usual mediums below.